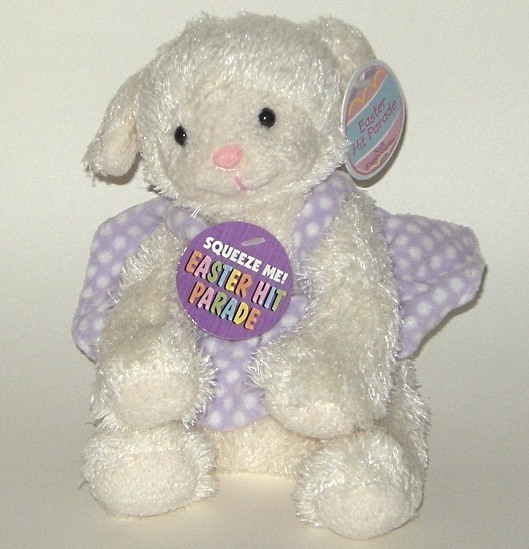 DanDee Musical Easter Soft Expressions Lamb Dandee musical Easter lamb Sings song when squeezed 8 inches tall New with tag This little lamb from DanDee Soft Expressions sings a cheerful Easter song when you squeeze her. She is wearing a purple and white polka dot dress. Measures 8 inches tall. New with tag. Note: All our items for sale are pre-owned and come from various sources. Though cleaned, sanitized and deodorized, we can't guarantee they are free of all odors, allergens, irritants, or other potential issues. If this may be problematic for you, please pass us by. Thank you.